Military Drone Market size in 2016 was estimated to be over USD 5 billion with a fleet size of over 13 thousand units and is anticipated to grow at around 12% CAGR over the forecast timespan. 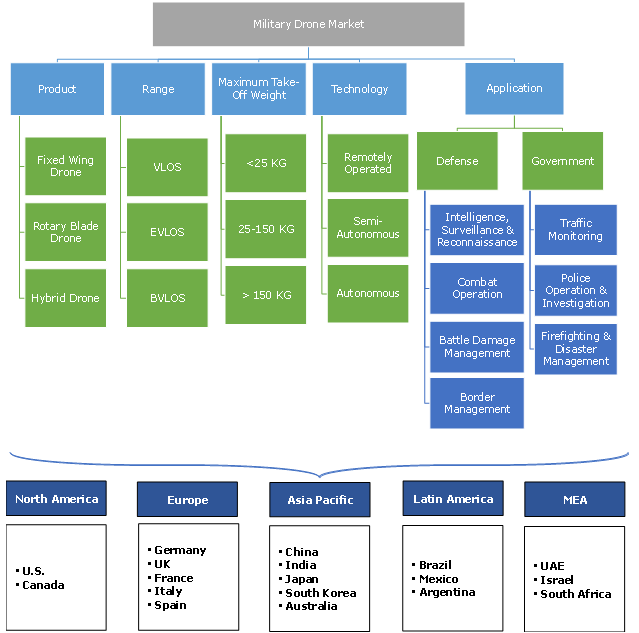 Military drone market is driven by the increasing procurement of UAVs for combat operations and surveillance purposes by the government across the countries. The increasing internal and external threats are encouraging the government to adopt the drone technology for gathering intelligence related to the developments on the battlefield, assessing battle damages, and performing high-level reconnaissance activities. Furthermore, the increasing utilization of UAVs for administrative functions such as traffic monitoring and police investigations along with emergency response services that include firefighting and disaster management also foster the market growth. The drone can effectively track and monitor real-time traffic congestions; it proficiently facilitates the quick dispatch of patrol units for relieving vehicle congestions and optimizing traffic monitoring and management functions. In addition, drones are also witnessing a rapid adoption in wildfire prevention operations, where they assist firefighters in determining hot spots using thermal imaging capabilities. The rotary blade military drone market is anticipated to account for more than 65% of the revenue share in 2016. The growth of the market is attributed to the increasing demand for rotary blade drones for surveillance and spying applications. Their ability to take-off and land vertically is also estimated to be a major factor driving their demand. They can perform quick maneuvering for border security management, where the emphasis is on precision maneuvering and the ability to keep a visual sight on a target for a long period of time. The hybrid drone market is estimated to grow substantially during the forecast period with the growth rate of over 15%. Their high payload capability and better flight control are the major factors driving the market growth. The extended flight time along with the ability to take-off and land vertically is also a major driving force. Semi-autonomous drone is leading the military drone market space. This mode of operation constitutes advantages of both the autonomous and remotely-operated drones. The ability to provide control to the flight and reduce the human intervention is estimated to be one of the major factors driving their demand. Autonomous military drone market is estimated to grow at a CAGR of over 18% during the forecast period. The technological advancement in the drones is the primary factor driving the market growth. The development of the collision detection and artificial intelligence-enabled drone is also estimated to fuel the demand for the critical combat and spy operations. Beyond Visual Line of Sight (BVLOS) drone is estimated to account for more than 67% of the global military drone market share. The wide adoption of drones for combat, long-distance inspections, long-duration high-altitude, and rapid response operations is the major factor driving the market growth. Furthermore, the supportive government initiatives for deploying drones for government applications such as traffic monitoring, firefighting, and disaster management applications are also estimated to drive the demand. For instance, in October 2017, the U.S. government established a program for expanding drone testing by allowing UAVs to fly during the nighttime over people and beyond the visual line of sight. The market for the maximum take-off weight 25KG - 150KG is estimated to hold more than 50% share in the global military drone fleet size. The high tactical capabilities with simple operation and maintenance procedures are one of the major factors driving the market growth. Their high versatility and the ability to perform a wide range of critical missions such as rescue operations, intelligence missions, traffic monitoring, and support to ground forces also aid in the market growth. The military drone market for payload of over 150KG is estimated to grow at a CAGR of over 11% during the forecast period. The growing demand for High Altitude Low Endurance (HALE) drones for combat operations is estimated to be a primary factor driving the growth. Furthermore, the increasing procurement of high capabilities drones by the developing economies including India and China is also estimated to drive the military drone market growth. Defense was estimated to be the dominating application with a revenue share of over 85% in the year 2016. 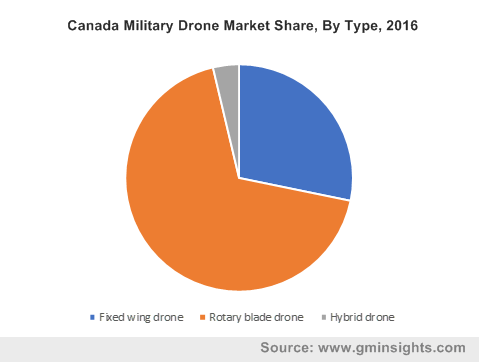 The increasing use of drones for combat operations, intelligence, surveillance, and reconnaissance activities is estimated to be the major factors driving the growth of the market. The advancements in the design of the drones along with improved battery life, fuel capacity, and flight control are also estimated to augment the demand of drones for defense purposes. Furthermore, the development of nano and mini-drones for spying and border surveillance application also aids in the growth of the military drone market. The procurement of the drones for government applications is estimated to rise significantly during the forecast period. Government agencies are increasingly deploying drones for effectively managing administrative functions and public services to ensure accelerated service delivery to the citizens. The deployment of drones for functions such as traffic monitoring, law enforcement operations, and disaster relief management enables enhanced public safety, streamlined administrative control, and improved productivity of public departments. North America accounts for more than 70% share in the global military drone market. The demand is driven by the wide adoption of drones in the U.S. for defense and civil applications. The U.S. Customs and Border protection is using drones for monitoring the Mexican-American Border and Department of Homeland Security and the Federal Bureau of Investigation (FBI) is using drones for law enforcement and protection. Furthermore, the increasing adoption of drones for government applications also aids in the market growth. For instance, the U.S. government is testing various UAV technologies for building drones that can travel seamlessly across spot beams on a satellite without losing contact. Similarly, the U.S. Department of Interior is also planning to adopt the drone technology for cutting down the natural hazards such as forest fires. The military drone market is characterized by the presence of major aerospace design and manufacturing companies. The major vendors of drones are General Atomic, Northrop Grumman, Lockheed Martin, Boeing, BAE Systems, Inc., Israel Aerospace Industries Ltd., China Aerospace, Aerovironment, Inc., Leonardo, and Textron Systems. The players offer complete solutions that include drone, platforms, software platforms, and services to enhance their customer base and profitability. The strategic partnership is the most common strategy used by the players to gain market share. For instance, in 2018, General Atomics forms an alliance with the U.S. Navy to deliver MQ-25 Stingray product for tanking missions. Similarly, in 2017, Textron System received a contract from the U.S. Navy to provide two Common Unmanned Surface Vehicles (CUSV) for the U.S Navy’s Unmanned Influence Sweep System (UISS) program. Military drones, also known as remotely piloted or unmanned aircraft range in size from simple, hand-operated systems to long endurance, high-altitude systems similar in operation to manned aircraft. They loiter over a specific area for many hours to offer commanders with persistent surveillance of enemy positions and allow ground-based troops to look beyond hills to identify enemy positions without risking the lives of the service personnel. Drones have assumed a leading role in counterinsurgency and counterterrorism. Countries around the world are increasingly incorporating drone-based defense and combat systems for modernizing their military capabilities. For instance, the U.S. Department of Defense (DOD) budget request for the Fiscal Year 2018 contains USD 6.97 billion for drone-related procurement, R&D, and system-specific constructions.